When I found the book KUL med tyger at my parents' house this Christmas, I recognized it at once. It might not look all that special, but I clearly remember reading it over and over again as a kid, dreaming of all projects I would do one day. I don't know why I didn't try any of the projects then, at least I don't remember doing so. 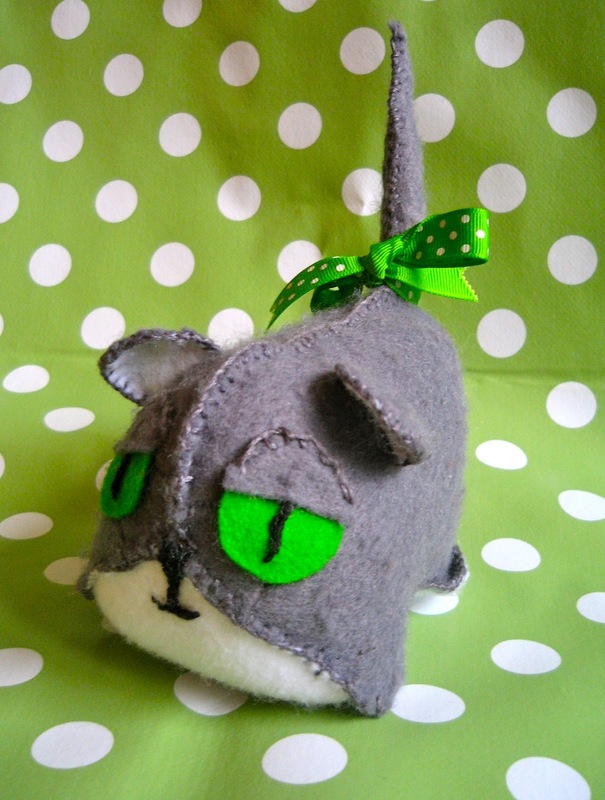 Anyway, the thing I remembered most clearly was that I planned to make a grey and white felt cat. So, almost 35 years later, the dream came true... The cat is here! Better late than never. 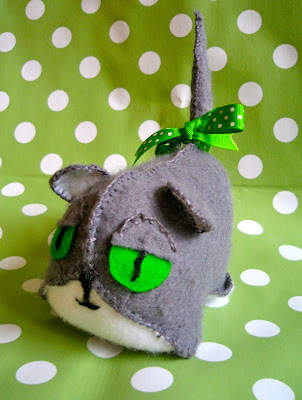 It was easy to make and is really cute, as long as you don't look too closely at the stitching. And baby I loves it. Now I'm ready for more, I have already bought the fabric to make a lion, and the giant ballon felt owl in the book is also tempting. I'll keep you posted. It is translated to Swedish from English, but it doesn't say what the original title is. Does anyone recognize it? There are several books in the same series, about crafting with paper, yarn, clay, and so on. The tutorial and pattern. Super instructive and clear, I wish I could find more books today that look like this. 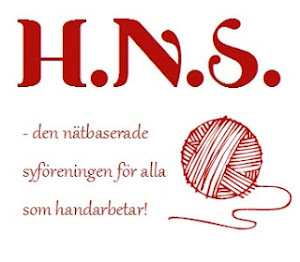 Summary in Swedish: När jag hittade boken KUL med tyger hos mina föräldrar i julas, mindes jag hur jag bläddrat igenom den som barn. Jag planerade bl a att göra en grå och vit katt i filt, men det blev aldrig av. Förrän nu! Tada, 35 år senare är katten klar. Bättre sent än aldrig, eller? Någon som känner igen boken, eller hade någon av de andra böckerna i serien?